Posted March 5, 2018 & filed under Things to do in Rehoboth Beach DE, Visit Rehoboth Beach. March is a wonderful time to visit the Delaware coast. The weather is warming up, and while it may still be too cold to swim, it is a fantastic time for hiking, biking and other outdoor pursuits. If you visit on St. Patrick’s Day, you will also have great opportunities to have fun and celebrate Irish heritage. Start your day with the luck of the Irish with a hearty meal at the distillery. Starting at 11 a.m., you can enjoy a special Irish-themed brunch featuring traditional dishes. In honor of the holiday, Dogfish is also launching an off-centered Chesapeake Oyster Luge. This exciting treat is a flight of 4 Dogfish Head Distilling Co. whiskey samples, paired with 4 Chesapeake oysters for just $18. For only $30, you can double the fun with 8 samples and 8 oysters. The Dogfish Head brewpub is also getting in on the fun, with a full-day St. Patty’s celebration beginning at 11 a.m. 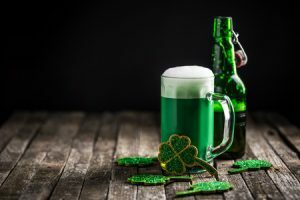 Enjoy authentic dishes, red ale brewed especially for the holiday, and if you stick around late, live traditional Irish tunes from Home Brew at 10 pm. With the distillery at 316 and the brewpub at 320 Rehoboth Avenue in Rehoboth Beach, Dogfish Head is just a hop, skip and jump from the Atlantic View Hotel. Book your stay at our beautiful, relaxing property today, and enjoy a full day of Irish fun on St. Patrick’s Day!